This is a swivel pedestal bucket bar stool. This This is a stool built for both durability and comfort. This bar stool features clean lines and works almost anywhere. The Esther stool features a stylish channeled back. 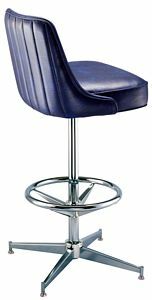 This bar stool features a chrome plated steel frame with a chrome plated foot rest. This product is manufactured in the USA.